Poll: Do You Use Front Wide Speakers? In all the years I’ve had surround sound, I’d never given much thought to implementing Front Wide speakers between my main Left and Right channels and the Surround speakers. Recently, however, I gave it some consideration. Does anyone here use Front Wides? Is it worth the effort? This train of thought started as a result of my idly perusing the Electronics section of my local Craig’s List, where I spotted a pair of bookshelf speakers that are part of the same model range and were designed as a timbre match for my main tower speakers. I didn’t really need them (my existing speakers are all perfectly fine), but they’re prettier to look at than my other Surround speakers and the deal was too good to pass up. 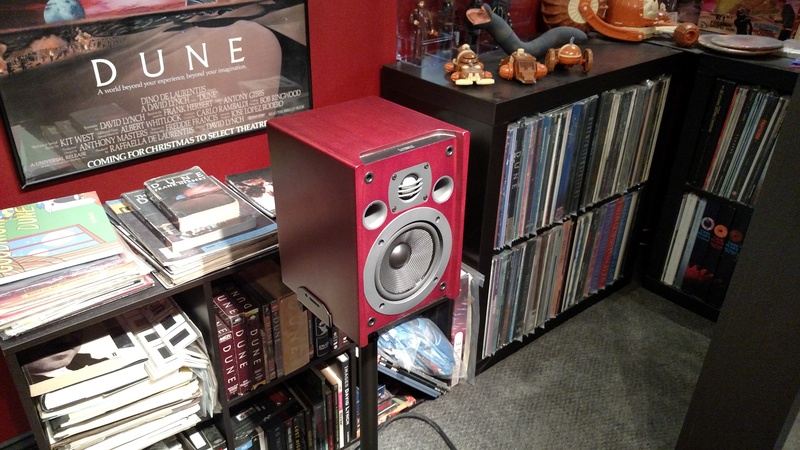 (In fact, I wound up spending more to buy new stands for them than I did on the speakers themselves.) After picking up the speakers, I put them in the Surround Left and Surround Right positions to the sides of my seating and pulled my prior speakers from those spots out of service. This leaves me with two perfectly good speakers I’m not doing anything with. (Actually, I have a bunch of spare speakers I’m not currently using, but these would really stand out as a waste of potential.) The idea of that gnawed away at me until I started considering the idea of moving the new speakers to the Front Wide positions and putting my previous speakers back where they started at the Surrounds. Planning this out, I ultimately realized that it wouldn’t be feasible. Although my Denon AVR-X8500H receiver is the flagship model capable of decoding 13 channels of Dolby Atmos surround sound, I’m already at the processing limit with a 7.1.6 setup. I thought about removing the Surround Backs for a 5.1.6(+W) configuration, but it turns out the receiver doesn’t support that. If you engage Front Wide speakers, Atmos and DTS:X are restricted to decoding only four height channels, even if you’re still within the 13-channel limit. The only way to use Front Wides is to scale back to 5.1.4(+W) or 7.1.4(+W). The main reason I upgraded to the X8500H is for 6 height channel decoding, and I’m not giving that up. I guess I’m sticking with 7.1.6. This leaves me wondering if I’m really missing anything, of course. I know that some people who have Front Wide speakers really love them. What’s the consensus among our readers? Are Front Wide speakers are worthy upgrade or a waste of time? Do You Use Front Wide Speakers? I use Front Wides and love them! They really open up my soundstage. I use Front Wides but hardly ever notice them doing anything. I used Front Wides at one time, but eventually removed them. I've thought about it but haven't gone through with it yet. Front Wide speakers simply wouldn't work in my room and/or system. I've never even given this any thought. This seems useless to me. I'd never do it. My TV speakers/soundbar are plenty enough for me. Surround sound is for suckers! True audiophiles listen to everything in 2-channel stereo! I too, would like to know how they are implemented. Any good examples of movies that use them to good effect? I also asked this question on AVSForum and was recommended the Atmos tracks on Gravity, Unbroken, The Matrix, and Westworld season 1 for good use of Wide channels. Westworld apparently moves most of the musical score out of the front mains and over to the Wide speakers if you have them. It seems like it would be best suited to a large room, but that can be said of all of those overhead speakers. My room looks more like the one in the diagram above, but with surround backs for a 7.1.2 set up. I even hesitated on those, but do find that the 7.1 is definitely a big step up from 5.1, from the 7.1 and especially Atmos or DTS:X tracks. I could see Gravity really taking advantage of the front wides, though. Mad Max: Fury Road, too. I have thought about it – if my room was any larger, I would have put more thought into it. They would have to go on stands if I did. Not 100% sure how I would implement it – I thought about combining the output of two channels into a separate amp. In the end, I don’t think the issue is so much a sound hole as it is with my furniture absorbing sound, and not really sure if extra speakers would help. Even if you had an amp that handled it, the sound would still be matrixed (although that really is not AS BAD as people make it out to be – yes, descrete is much better, but matrixed isn’t bad). In the end, while I have thought about it, it doesn’t really make sense for my space, and it is just too much trouble. To me, a 7.1 is much more immersive, and if I had to choose between width and height, I would go height. But it all depends on the shape of your room. Based on pictures I have seen of your setup, it would seem more like you would want to add depth instead of width. I wish I could draw a diagram, but my thought is have your three in front, 2 behind you, six on the ceiling, then like 2 on each side wall. So your surround left and surround right would be about where you sit on the couch, then maybe combine your surround left and front left into another speaker and do the same on the right. The down side to that would be that you would have to control the volume on that separately, and I am not sure if that would achieve the sound I am thinking of, especially on sounds that are supposed to pan across the sound stage. Looking at the diagram again, it looks like width is KINDA doing what I would want it to do, but not quite. There really is no way to do it without designing a room for it (in a regular room, the speakers are just sitting right out there to be tripped over). It would probably be a nice thing – but then, so would 22.2……7.2.4 (or 5.2.4) is fine. I had a set of wide speakers years ago and loved them. It really gave the sound stage much more depth. Then, when I got married I had to move out of my large studio apartment and into a fairly small house. We did not have room for those speakers or the side ones. I was able to keep the rears though. We’ve now moved to a bigger house and I’m currently in the procurement stage. Unfortunately, my wife has limited me to 7 ear level speakers and I’m currently working on her for 6 height speakers. I’m not sure I could afford the extra processing for the extra wide speakers anyway, but I do remember them fondly. I think they are more of a must have for music lovers. They really helped with ambiance for movies too, but I think the height channels probably accomplish alot of that now. I didn’t have any height channels back then so I can’t compare with today’s standards.